I will install Exchange 2013 from the command prompt on Windows Server 2012. To install Exchange Server 2013, the forest functional level of Active Directory must be Windows Server 2003 or higher. You cannot install Exchange Server 2013 in Windows Server 2012 core version, minimal server interface. 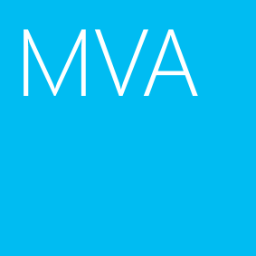 The following components must be installed in Windows Server 2012 before installing Exchange Server 2013 (Mailbox and Client Access server roles). 1. On Ex01, log in as Domain Administrator. 3. Perform "Install-WindowsFeature RSAT-ADDS, AS-HTTP-Activation, Desktop-Experience, NET-Framework-45-Features, RPC-over-HTTP-proxy, RSAT-Clustering, RSAT-Clustering-CmdInterface, Web-Mgmt-Console, WAS-Process-Model, Web-Asp-Net45, Web-Basic-Auth, Web-Client-Auth, Web-Digest-Auth, Web-Dir-Browsing, Web-Dyn-Compression, Web-Http-Errors, Web-Http-Logging, Web-Http-Redirect, Web-Http-Tracing, Web-ISAPI-Ext, Web-ISAPI-Filter, Web-Lgcy-Mgmt-Console, Web-Metabase, Web-Mgmt-Console, Web-Mgmt-Service, Web-Net-Ext45, Web-Request-Monitor, Web-Server, Web-Stat-Compression, Web-Static-Content, Web-Windows-Auth, Web-WMI, Windows-Identity-Foundation -Restart" to install required roles and features of Exchange 2013. 4. After the above roles and features have been installed, install the following software in EX01. Assuming that D drive is the DVD-Rom. 2. Insert Exchange Server 2013 DVD. 3. Launch "Command Prompt" as administrator. 4. Navigate to D:\, perform "Setup.exe /IAcceptExchangeServerLicenseTerms /ps" to extend Active Directory schema for supporting Exchange 2013. 5. 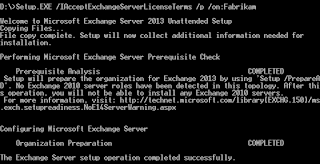 Perform "Setup.exe /IAcceptExchangeServerLicenseTerms /p /on:Fabrikam" to prepare Exchange Organization. 6. Perform "Setup.Exe /IAcceptExchangeServerLicenseTerms /pd" to prepare the domain. 7. Perform "Setup.Exe /IAcceptExchangeServerLicenseTerms /mode:install /r:mb, ca /MdbName:fabrikam_db01" to install Exchange 2013 with Mailbox and Client Access server role. 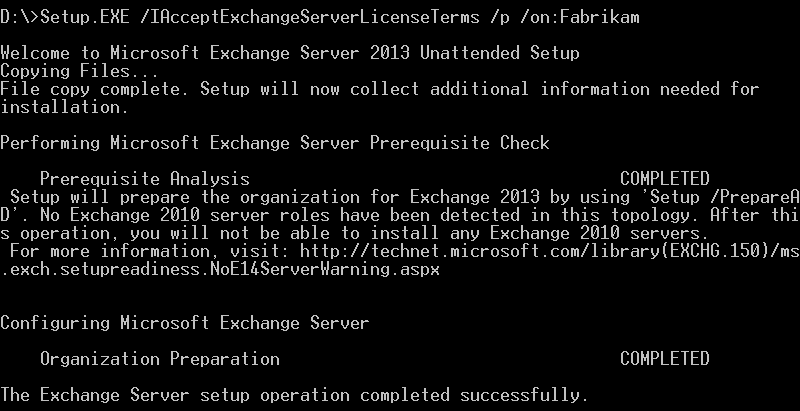 As a result, Exchange 2013 was installed successfully. Thank you very much for this post, been battling with this error for weeks now, you the only guy that got me past organization preparation failing. Now i'm stuck though, after running the last CMD it says preparing setup which completes and then it says mailbox role: transport service: Failed and gives error. The Following error was generated when "$error.clear(); set - local permissions -feature:"bridgehead" was run:'The registry key "software\microsoft\exchangeserver\v15\FIP-FS" does not exist under "HKEY_LOCAL_MACHINE"
Have you ever seen this error and do you know how i can solve it? I haven't seen this error. Could you please provide more information about your exchange and AD environment? Which operating system is you installed for the Exchange Server 2013? Server 2012 std. Running DC from same server. After trying to rerun the setup getting a hell of a lot of errors. Global updates need to be made to Active Directory, and this user account isn't a member of the 'Enterprise Admins' group. You must be a member of the 'Organization Management' role group or a member of the 'Enterprise Admins' group to continue. You must use an account that's a member of the Organization Management role group to install or upgrade the first Mailbox server role in the topology. You must use an account that's a member of the Organization Management role group to install the first Client Access server role in the topology. You must use an account that's a member of the Organization Management role group to install or upgrade the first Client Access server role in the topology. You must use an account that's a member of the Organization Management role group to install the first Mailbox server role in the topology. Setup encountered a problem while validating the state of Active Directory: Couldn't find the Enterprise Organization container. The forest functional level of the current Active Directory forest is not Windows Server 2003 native or later. To install Exchange Server 2013, the forest functional level must be at least Windows Server 2003 native. Either Active Directory doesn't exist, or it can't be contacted. Installing Exchange Server on a domain controller will elevate the permissions for Exchange Trusted Subsystem to domain administrators. Setup will prepare the organization for Exchange 2013 by using 'Setup /PrepareAD'. No Exchange 2010 server roles have been detected in this topology. After this operation, you will not be able to install any Exchange 2010 servers. I literally dont know what to do. Ive even added another user with administrator rights but same errors. This is insane, why cant they just make it easier. Damn it to hell!!!! Microsoft doesn't suggest installing Exchange 2013 on a domain controller. Please read the following link for your information. I have no idea to solve the errors of your Exchange environment at this moment. Thanks so much for all the feed back and help, ive installed Server 2012 on a vmware now and just want to install exchange so going to try and do it like that. Heartfelt appreciation from here... Your post just ended two solid days of misery and Googling. The AD steps you list are unlike any other guides I've seen, and obviously the GUI installer that's supposed to be handling AD is not doing it correctly. The GUI installer appears to be riddled with timing-related defects, depending on the speed of one's hardware or VM. Hard to imagine how many hours of so many people's time gets wasted on this stuff, but I'm grateful that you've ended my suffering!